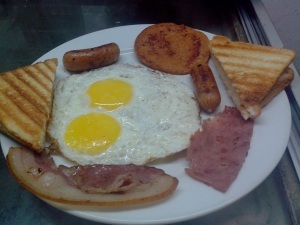 Full english breakfast in mumbai – For the best full english breakfast mumbai. Our scrumptious plate of pan tossed cuts of Salami, Ham, Bacon , and Sausages along with two Fried Eggs and Butter Toast is the most wholesome meal of the day you can indulge in here at Gables.This serves best, as a hearty breakfast as well as a mid day brunch. The best part of it is, we serve it throughout the day, even at night. The combination of meats change slightly on a daily basis, and you can expect a variety of them in your plate. Our other breakfast options include Ham, Egg, Chips and the classic Bacon n’ Eggs.